The apparel category Outerwear is just as it sounds. It’s the clothing worn over other clothes, usually in the cooler months. Some better known brands in this category are Ogio, Columbia, and Port Authority. Many of these garments are constructed in a way that does not allow for screen printing, so embroidery is the decoration method of choice for almost all of this category. These items tend to be a bit higher end and embroidery offers a higher perceived value. These outerwear garments tend to have a polyester or polyester-spandex blend bonded to a fleece, microfleece, or polyester lining. Common features for this apparel is water and wind resistance in varying degrees. Available in ladies styles and tall sizes. Sleeveless coats or jackets. Many of these items are fleece or micro fleece. You are probably also familiar with the puffy vest - polyester shell, lining and polyfill. Polyester shells with no fill account for the windbreaker style of vest. Each style pays special attention to zipper, pocket detail, and stitching in a unique way. Available in ladies styles and tall sizes. Think Soft Shells on steroids. In most cases these coats or jackets have a nylon shell with a mesh or polyester lining. Technical aspects include specific lining for the sleeve, body, and hood lining. These coats are specifically designed for wind and rain resistance. Zippered exterior and interior utilitarian pockets are special features of these garments. Embroidery is the preferred decoration for this apparel. High end coats and jackets. From the classic letterman style wood body with leather sleeves to the ladies lambskin dress jacket, embroidery is the preferred decoration for these garments. This category encompasses the deep pile fleece apparel available in a great variety of colors and styles including long sleeved versions and vests. Youth, ladies and men’s cuts are available. Non-hooded, full and ¾ zip casual apparel. Great as outerwear in the fall and spring and can be layered under coats in the winder. Embroidery is most suited for these garments. Athletic Warm Ups include traditional hoodies, crews and sweat pants. There is also and array of polyester shell style jackets that come in many styles and colors. Youth, women’s and men’s cuts are available. They are perfect for any sports organization and school team for warm up. This apparel also is great for simply lounging around. 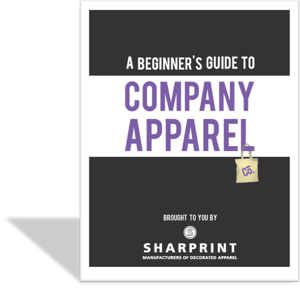 Embroidery or screen print are options depending on the specific garment. You guessed it - jean jackets. Timeless and classic. You may also want to check out the denim and twill letterman jackets. Cool and casual - a fashion favorite. Screen print and embroidery can be used to decorate these items.